Like most painters I am fascinated by color palettes, those used by both contemporary artists and the Old Masters. 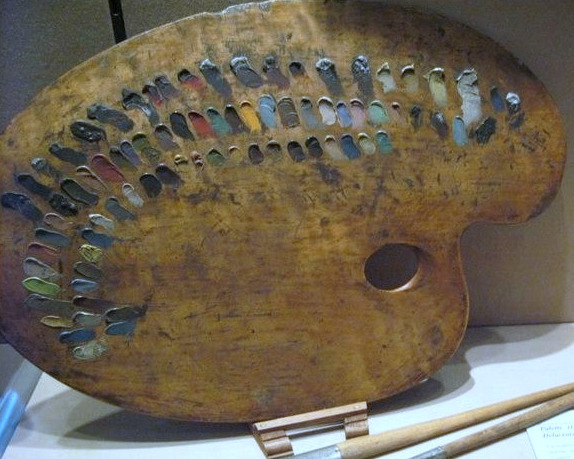 Most artists have a set palette they work with and maybe a hand full of convenience colors they use occasionally. The pigments an artist chooses for their personal palette are an insight into their thinking and creative process. I have always been a real fan of limited palettes for the simple inherent color harmony they produce. I have written about them before on my Pochade Box site. However I find myself continually returning to the first limited palette I was introduced to, a simple four color palette of red, yellow, white and black that is characteristic of the classical color palettes. With the "Grapes" painting I used a very basic earth toned palette, consisting of the three primaries and black and white. Mixtures of ivory black and white tend to read as blue. I developed this little color chart by random mixtures of these earth pigments, notice how “blue” the black mixture reads when next to the warm complementary earth tones. These were my core colors and the majority of my mixtures began with them. In the painting I did add other colors to the palette as I worked, mostly other earth tones which I also related to as red, yellow orange – Naples Yellow (yellow), raw umber (dark yellow-green), burnt umber (dark red) alizarin (bluish red). Still a fairly monochromatic warm earth palette. I used the Alizarin Crimson and Naples yellow to punch up a hue, which in relationship to these subtle earth tones was very intense and quickly gave me a new appreciation of the high chroma pigments. In this comparison you can clearly see the limited earth color palette in the pixellated image. Many of the Masters used similar limited palettes, based on a yellow, red, white and black substituted as a blue. Rembrandt, Velasquez, Goya certainly used something along the lines of a earth toned primary palette. And of course Anders Zorn’s legendary four color palette of Yellow Ocher, Cadmium Red Medium, Ivory Black plus White. One could argue that many painters before the 19th century just did not have access to many pigments. But after the turn of the century and a whole world of tube colors at the artists reach these pigments remain. The earth tone palette is perfect for matching the colors of the natural world. Painting from direct observation with a limited palette will force you see the subtleties of each color note you mix. You will pay closer attention to the color bias and its temperature. Using a earth tone palette you can work with color and still emphasize tonal values. This “family” of closely related earth tone colors lend themselves perfectly to producing light and shade and is one of the reasons that great artists, Rembrandt, Titian, Rubens, and Hals have produced such a large spectrum of colors from such a small core of pigments. I see this simple harmonizing core of earth toned primaries inside almost all of the major representational painters I admire. 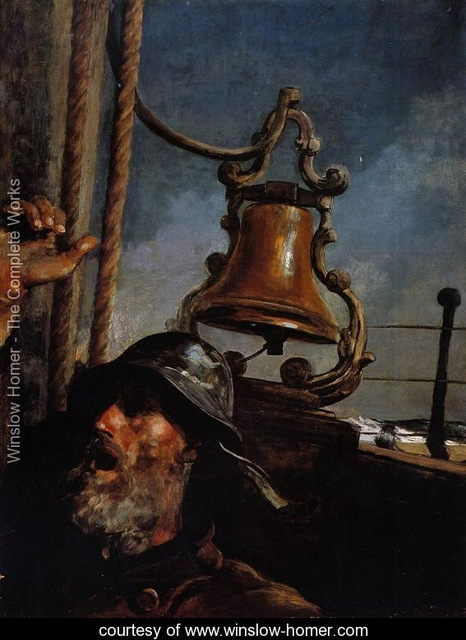 One of my favorite artists, Winslow Homer's palette was based on a low keyed palette of earth colors augmented with some umber and a blue. Interesting that Edgar Payne, one of the most noted and misunderstood American landscape painters (this man was not an impressionist no matter what the “plein-air” crowd wants to believe, just look at his theories and practices) used a mixture of red, yellow, and blue as a harmonizer, which he referred to as the “soup” in his paintings. A neutral gray tone that is made from a mixture of Indian red, ultramarine blue, and a bit of yellow. Why, because Payne knew just like the old masters that the best way to create harmony is by complementary mixtures, being that by each color mix having a bit of the colored "soup", assures a unity and harmony overall in the painting. Painting, especially “color” is about relationships, what happens to one color when next to another, how does it effect hue, value, chroma? Obviously there is a infinite number of colors we see in the world and attempting to match all those color notes let alone harmonies without some type of color “theory” would be overwhelming. Now, before we go off track here, I want to say there are endless books written on color theory. And I highly recommend Michael Wilcox's books on color. There are many other good ones in fact, but trying to understand color and how it works with out pulling out some paints and brushes is like trying to play the piano by looking at it. What Edgar Paynes "soup" tells us is that gray is the combination of the three primaries red, yellow and blue, understanding that gray can be warm, cool or neutral is important to understanding its use as an unifying color. The method or genius of a limited palette is that the complement of each color is the mixture of the other two colors, no easier way to use and harmonize color than to mix it from the primaries. As I meander around with this discussion I thought it might be helpful to state what benefits I see in a limited earth palette. First everything we do as painters is directed to developing knowledge about how to manipulate hue, value and chroma. 2.Color must be seen in relationship - you must always look at the effect one color has on another. Verbally saying that, “that is a red apple” is much different than visually saying that. 3.Black is a Color - it can be abused, but no matter what your high school art teacher told you, you can use it as a modifier. 4.Mix Neutrals with Complementary Colors - Mix any two color complements in unequal parts with white and you will create a range of neutral grays. These grays will have an innate harmony and unity. I think it boils down to this, as artists/painters we must develop an instinctive understanding of the colors on our palette. By developing a personal color palette with the fewest number of colors, based on core color that we subconsciously understand we can most effectively bring expression to the subject we see. 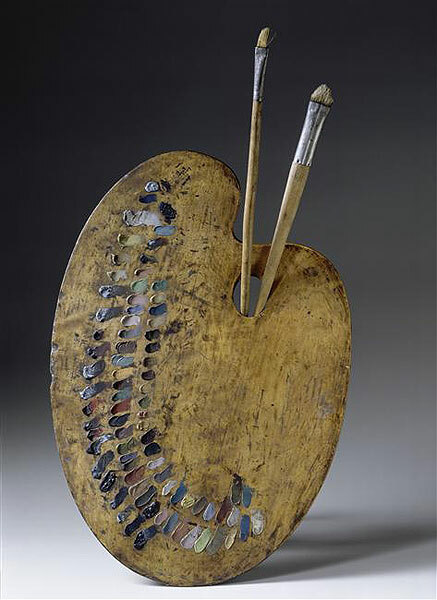 One of the most interesting physical palettes that exist is that of Delacroix’s. It was documented that he would methodically mix dozens of color on his palette. The arrangement is unique and inundated with beautiful neutrals and earth tones. "I can paint you the skin of Venus with mud, provided you let me surround it as I will." 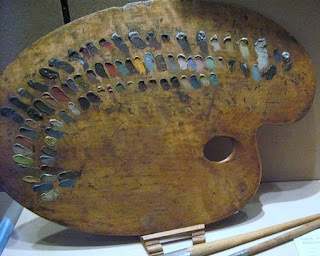 Great site ran by artist Aaron Miller, about artist palettes. Fantastic info and demo about the Zorn palette by artist Michael Lynn Adams.